The clash between Mexico and Sweden will be played at the Central Stadium in Yekaterinburg on June 27th. The Tricolor justified the role of a favorite in a tilt with South Korea and has six points at the top of the Group F, while the Swedes were unlucky to lose in the dying moments to Germany after having a lead at the break. Mexico was highly motivated to record another win following a heroic 1-0 victory over Germany, and they managed to do so with a 2-1 victory over South Korea. The Tricolor took a 1- lead through Carlos Vela’s penalty in the 26th minute, while Chicharito made it 2-0 in the 66th, and at that point, it was evident that the Mexicans will win at -143. The South Koreans clawed one back in the 93rd minute as Heung-Min Son scored his nation’s first goal at the tournament, but it was a bit too late for a comeback. However, that goal did mean a world for the punters who backed over 2.5 goals at +110 and BTTS at +104. On the other hand, Sweden started the game with the Germans very well and took a 1-0 lead in the 32nd minute thanks to Ola Toivonen’s great lob over Manuel Neuer, but Die Mannschaft responded early in the second half through Marco Reus to tie the score. The BTTS at -125 was in the books, but if you had a bet on over 2.5 goals at -125, you had to wait until the final second of the tilt when Toni Kroos hit the left top corner of Robin Olsen’s goal to set the final score, 2-1 for the reigning World Champs. Hirving Lozano is one of the most-wanted players in the transfer market at the moment and there is every reason for that after impressive displays in the first two games at the World Cup. Following a winner against Germany, Lozano recorded an assist in a duel with South Korea, and he could be the one to eliminate Sweden out of the tournament. We didn’t see much from Emil Forsberg thus far, and it’s about time for Sweden’s best player to show his quality and influence in the most important game for his nation. It won’t be easy facing the hard-working Mexican midfielders, but the Blue-Yellow is desperate for Forsberg to contribute. Mexico: Ochoa; Alvarez, Moreno, Salcedo, Gallardo; Herrera, Layun, Guardado; Vela, Lozano, Chicharito. Sweden: Olsen; Lustig, Lindelof, Granqvist, Augustinsson; Ekdal, Larsson, Forsberg, Claesson; Berg, Toivonen. Mexico’s chances to win the World Cup are now +4000, while the Tricolor is +350 to reach the quarter-finals. Sweden’s chances to win the World Cup are now +25000, while the Blue-Yellow is +800 to reach the quarter-finals. Mexico is a slight favorite at +145 on this one, but I don’t think they will try to get three points if they don’t have the right opportunity, so they will likely sit back and let Sweden control the ball with hopes of hurting them on the break. The situation could change if the Blue-Yellow scores an early goal, so the pressure could be on the Tricolor as they are much better in transition than from a possession play. 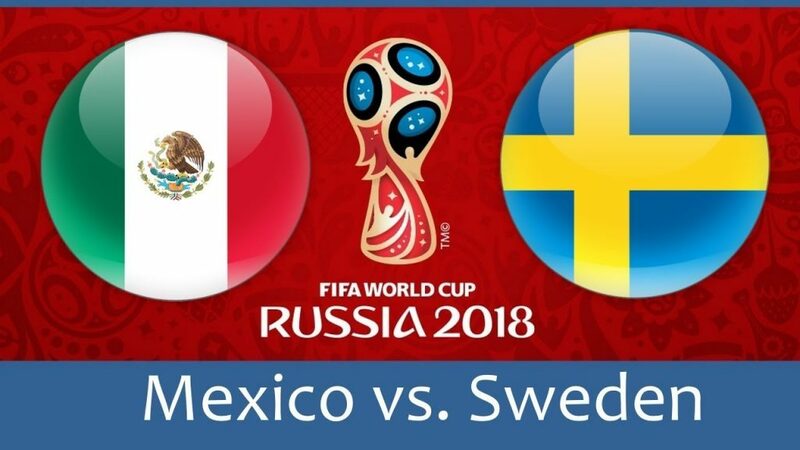 Sweden must score at least one goal and I think they will do it, but also, Mexico should find the net on the other end as well.